The screen shot above is my proof that the giveaway was not rigged. Heh heh heh. 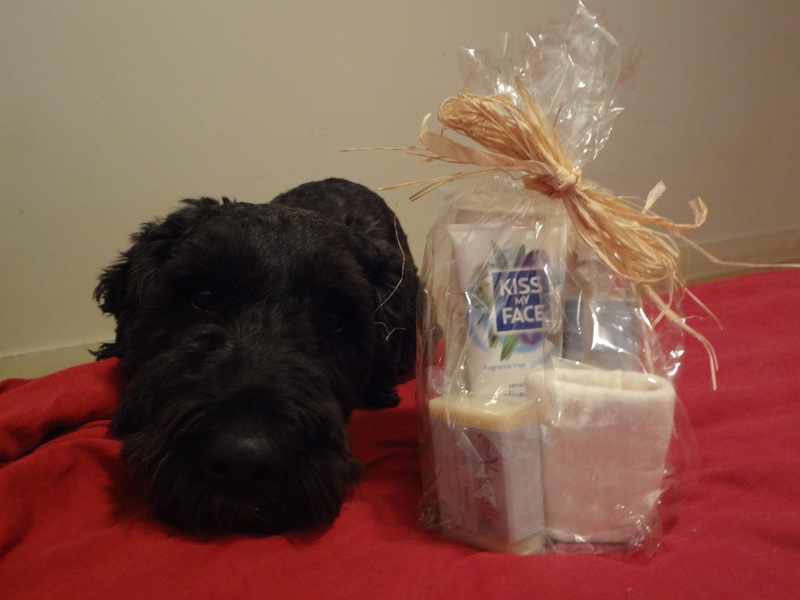 Natural & Unscented Personal Care Travel Kit & Eco Tote (US & Canada) Claimed by Ro! Natural & Fragrance-Free Body Care Bag (US & Canada) Claimed by Starre! Staples Easy Button (US & Canada) Claimed by PawPower! 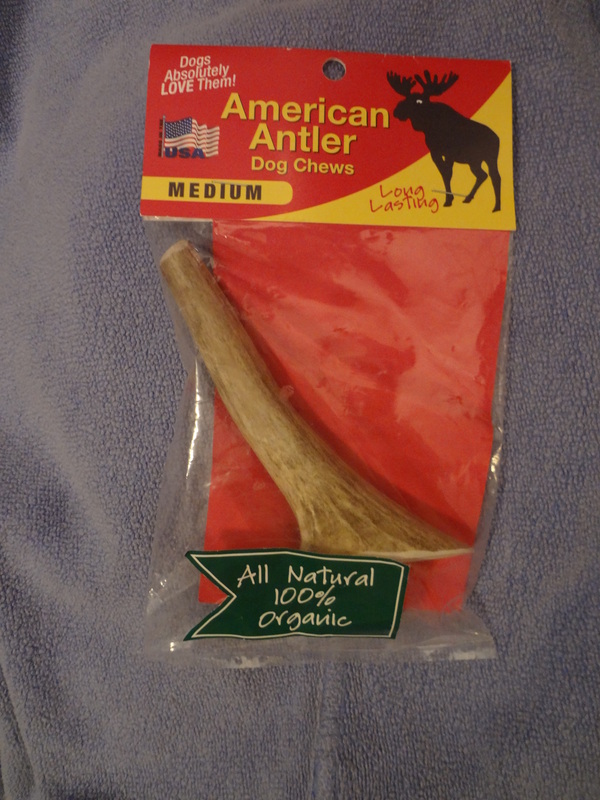 Deer antler dog chew (US & Canada) Claimed by Martha! A pair of Bark’n Boots (International) Claimed by Frida Writes! 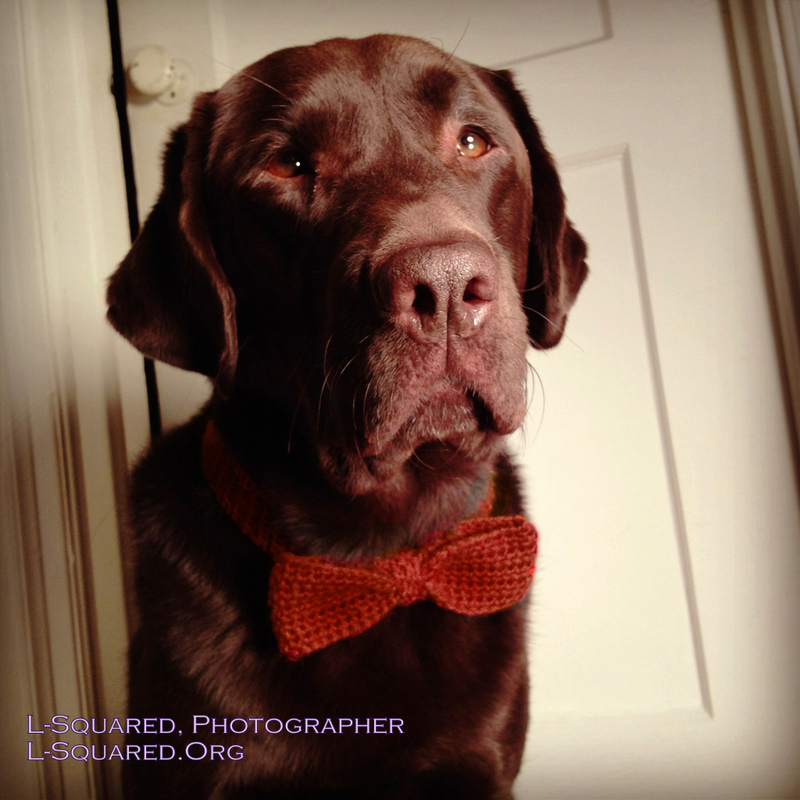 A dog bow tie (continental US only) Claimed by Sharon! To get more details about what each prize includes, plus links and photos, please see the #ADBC 10 Swag post. Since there are seven prizes, we can have seven winners! Here’s how we’ll do it…. The first place winner, Frida Writes, gets first pick. (Congratulations!) Please comment below about which item you want, and the person who donated it will get in touch for your mailing address. Then the second place winner, Martha, gets her pick, and so on. This will be easiest if each winner puts their pick in the comment section below so that everyone can follow along in order. If commenting here is a PITA for you, please tweet me at @aftergadget with your preference. Note: Some items have geographic restrictions on shipping, so if you live outside the continental United States, please pick accordingly. Also, if you don’t want any of the prizes available to you, please let me know so the next person in the sequence can be given the option. As I mentioned in the call for posts for the tenth Assistance Dog Blog Carnival (ADBC), there will be a raffle this time. Anyone who submits a post will be entered. The drawing will take place after the carnival goes up. 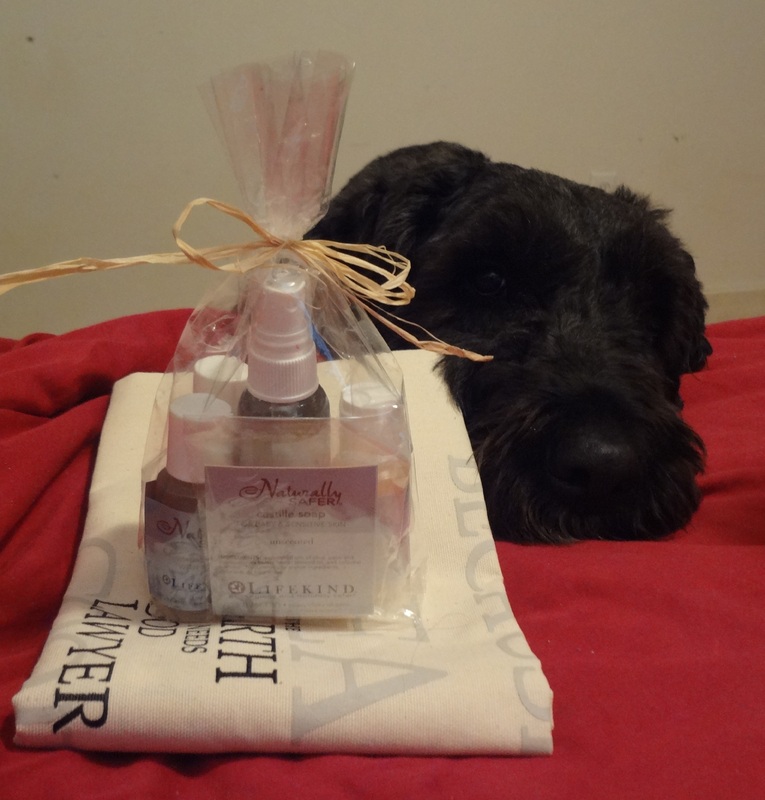 A gift bag is always more enticing if there’s a cute dog next to it. Ah, dog training. Such a serious pursuit…. It makes me even more distinguished. In a recent post, I commented on the problem that all assistance dog handlers face: distraction from the public. In my case, there’s a slightly different twist. While Barnum’s work at home is zipping along beautifully, we have a long way to go with his public access skills. This is because I so rarely go anywhere. However, now that it’s summer, and I’m a little more functional, I’m more often able to take Barnum to public venues to train. 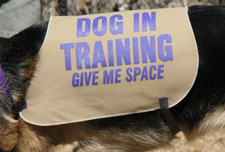 When we’re training in public, I always put the “In Training” patches on his vest under the “Service Dog” patches, but I don’t think anyone sees them. I think even if they were ten times larger, the sight of a woman in a wheelchair with a dog with gear on would automatically translate to “service dog” in most people’s minds, and people would still not really “see” the “In Training” badges. The poor visibility of the “In Training” patches raises two concerns. One of my concerns is that if we’re in a store, and Barnum’s comportment is far-from-perfect, I’m not comfortable with people believing he’s a SD because I worry that we will give other SDs a bad name, or that we will support the myth that partner-trained SDs are not as well-trained as program dogs. 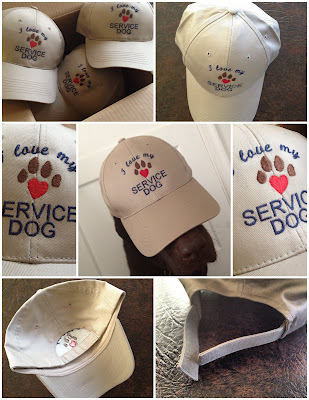 Even worse, because I know that some individuals try to pass off pets as SDs (which is illegal as well as unethical), I worry that people will become used to seeing a badly behaved dog as a “service dog,” and that will support the efforts of those who commit fraud. The second problem is people wanting to talk with me. When I am working Barnum in public, I am unable to communicate with other people. I can’t split my focus. When I try to tell them that I can’t talk, I think I usually end up coming across as very rude because it’s just impossible for me to answer questions, chat, or anything else when I am trying to use my limited energy and focus on extremely demanding training. People who want to talk to me or who want to interact with Barnum are equally big problems in this stage of our training. I recently came across two products that are designed to tell strangers not to interact with your dog. They are in the DINOS (dogs in need of space) resource section of Notes from a Dog Walker. They are both primarily intended for dogs who are reactive to people or other dogs. DINOS can include fearful dogs, aggressive dogs, or overexuberant dogs (which Barnum was sometimes in the past with other dogs). Barnum is not reactive to people or dogs, however I think this gear could be really useful to Barnum and me as an SDiT team in public. I’m not sure which to get. I’d like your opinion. These colors are very eye-catching. You can read a description of the materials and see additional views of this vest at Clean Run. What I like about this vest is that it has the message very forcibly on both sides, and to a lesser degree, from the top. It also looks like it will last well, and it looks professional, so I could keep using it as we improve our public manners. Red and black help get across the “Keep Away” message, I think. I’m also wondering if I’d be able to remove those patches and put them on his working gear when he’s no longer training. A very large “Do Not DISTRACT” patch is definitely preferable to the smaller “Please Don’t Pet Me, I’m Working,” patch that we have now. I’d like something that I can fit over Barnum’s pack, if possible, because I’m using the pack as a cue to teach him that a certain standard of behavior is required. I’m not sure if that would be possible with this. But the tradeoff might be worth it. I also wish it covered more of the dog, because between my big self and my big chair and Barnum’s big self, I would want to make sure the message didn’t get lost. The biggest drawback, in addition to the minimal size of the vest, is definitely the price: $100+. I could also pay extra for a badge for me to wear that says “In training, do not distract,” but I doubt that would be useful. Most people seem to have trouble seeing me inside all the assistive equipment anyway. Plus, being in a chair means I couldn’t put this badge anywhere close to eye level for a standing adult. For those who know me and want to be friendly and chat, my presence as a familiar face would probably override a little badge. Most people look at the dog, anyway. This covers more of the dog. There are more pictures of this vest on different sizes and breeds of dog at The Pawsitive Dog, including the option for a harness hole in the back. 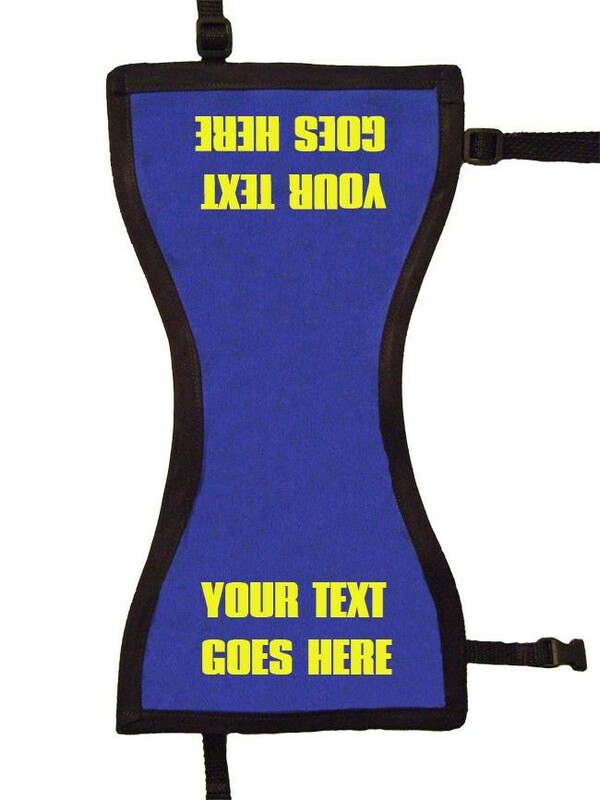 It has the same text on both sides of the vest. It covers more of the dog. There is just one message, and it’s pretty straightforward. The size of the lettering is huge; there’s not much to distract from the message. At $38, it’s also less than half the price of the other one. This seems most likely to fit over Barnum’s working pack. It doesn’t look as professional. My biggest concern is that I’m not sure if medium purple on tan is bright enough and has enough contrast to get the message across. 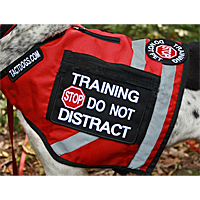 The Dog In Training vest is made of a poly/cotton blend fabric with cotton straps and “Soft Touch” Velcro. It is durable and washable, but still not heavy or noisy. To use it over his pack, I would measure his chest with his pack in place. I do suggest air drying to preserve the screen printed lettering. This might be the winner, if I can contact them…. Notes From a Dog Walker — the creator of the term, DINOS — commented below and suggested this online store. Much more reasonably priced than either of the other options. I can choose the color of the material. (Not sure if I can choose the color of the text.) This means I can choose colors AND a message that I think will be the clearest and the most obvious! I think this is least likely to fit it over his pack. I’m emailing them with questions about sizing, colors, etc. I’d particularly like to hear from members of the general public who do not have assistance dogs: Which vest do you think would more likely keep you from approaching a person and dog and trying to engage either the person or the dog? If you knew the person or dog? If they were strangers? I’d also like to hear from other assistance dog handlers. Which do you think would be more effective, based on your own experiences? If you were going to buy one, which one would you get? I look forward to everyone’s responses! Please feel free to cast your vote (and offer your reasoning, if you’re so inclined) in the comments to this post. You can also tweet me on Twitter at @aftergadget.